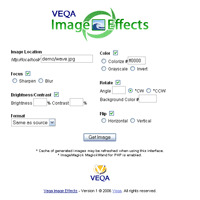 Veqa Image Effects is a PHP tool to get Web image effects on the fly. Features: sharpen, blur, brightness, contrast, colorize, grayscale, invert, rotate, flip, and reformat. It supports JPG, GIF, PNG, and BMP image formats and works with GD or ImageMagick MagickWand for PHP. Make all these your cause to bring the effect of your images and do it automatically on the fly.